A tiny wooden sarcophagus embellished with all the intricacy of a coffin specimen from the ancient Egyptian Late Period – this was an incredible discovery made over hundred years ago, in 1907. 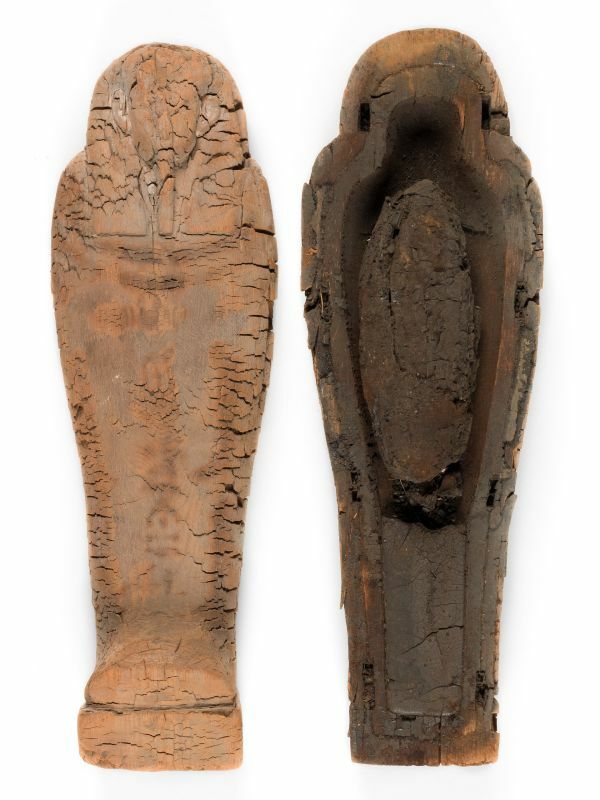 And now in 2016, curators at the British Fitzwilliam Museum (in Cambridge) have made another momentous revelation, and it relates to how this miniature coffin actually possesses the remains of a mummified fetus – believed to be only 16 to 18 weeks old (at the time of its demise). 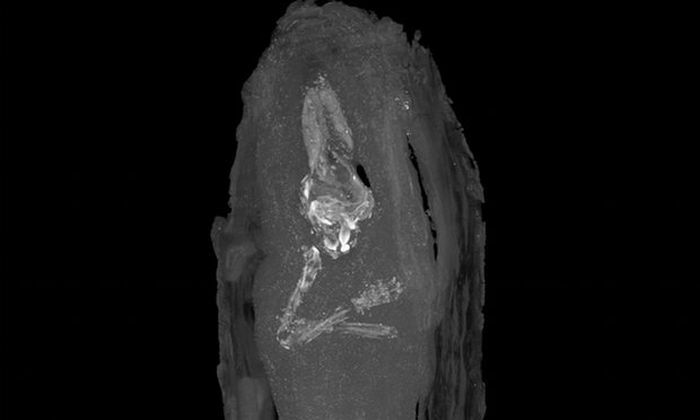 Simply put, this might very well be the youngest Egyptian mummy that researchers have come across, and it had resided in the diminutive sarcophagus for over 2,500 years, thus dating from 664 – 525 BC. 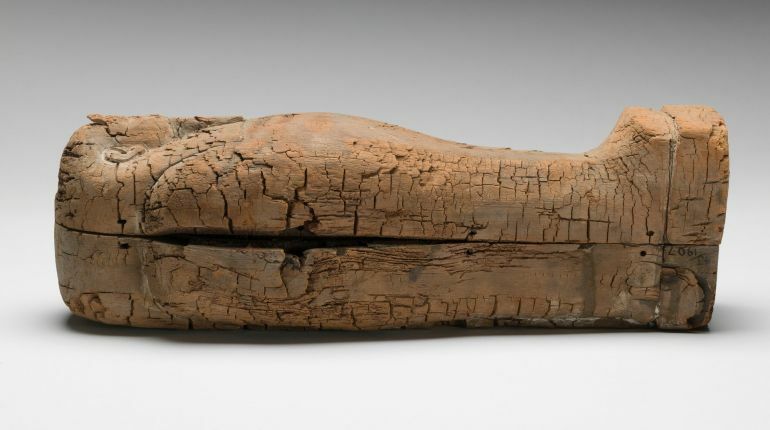 It is a perfect miniature example of a wooden coffin of the ancient Egyptian Late Period, dating from 664-525 BC. The lid and box are both made from cedar wood. Although the coffin is deteriorated, it is clear that the wood was carefully carved on a painstakingly small scale and decorated. From the micro CT scan it is noticeable that the fetus has its arms crossed over its chest. This, coupled with the intricacy of the tiny coffin and its decoration, are clear indications of the importance and time given to this burial in Egyptian society. The visible arms of the fetus. As for the ‘inside details’, the remains were carefully wrapped in layers of bandages. Now due to the rigors of time (which in this case equate to over two millenniums), the skull and pelvis area had biologically deteriorated, though the finger projections and bones from the hand and feet were still detectable. With further analysis, the researchers determined that this is the ‘only academically verified specimen to exist at only sixteen to eighteen weeks of gestation’, though the gender is still not identified. And in case you are wondering, the previous youngest mummy specimens were found in King Tutankhamun’s tomb – with their respective age developments accounting for around 25 weeks and 37 weeks into gestation. This ground-breaking find educates us further still in our conception of just how precious the unborn child was in Ancient Egyptian society. The care taken in the preparation of this burial clearly demonstrates the value placed on life, even in the first weeks of its inception. The tiny yet intricate coffin is currently on display as part of the exhibition Death on the Nile: Uncovering the Afterlife of ancient Egypt, at the aforementioned Fitzwilliam Museum.